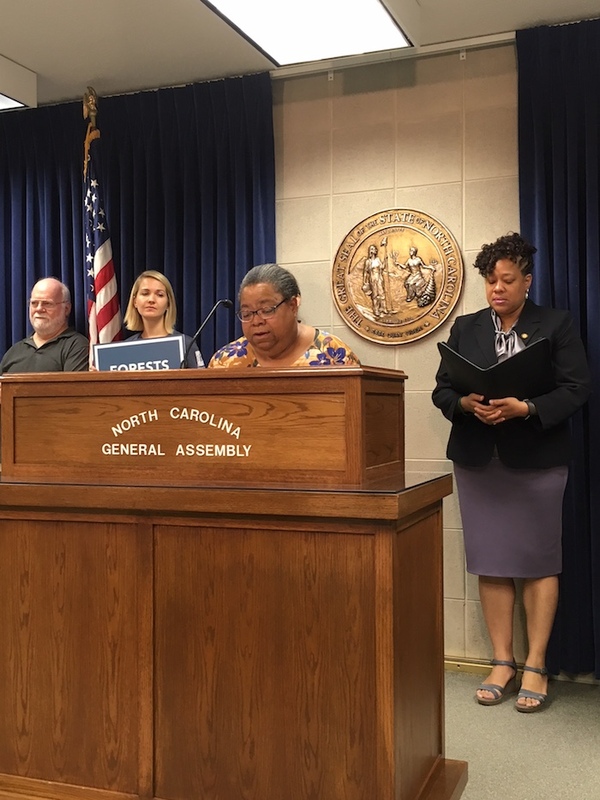 Forest protection advocates joined Democrats State Sen. Erica Smith and Rep. Cynthia Ball today in calling for stronger controls on the wood pellet industry in order to preserve the state’s timber stands and potentially blunt local effects of climate change. The Enviva wood pellet plant in Garysburg uses the equivalent of 50 acres of forest per day, said Sen. Smith, and the air emissions from the facility are “concerning” many of her constituents. Enviva uses North Carolina and Virginia timber to produce wood pellets that are then shipped to the United Kingdom, where they are burned in lieu of coal. Contrary to industry talking points, science shows wood is not a renewable energy source. The timbering and burning of wood releases carbon dioxide into the air; even when trees are replanted, it can take decades before they’re old enough to store significant amounts of carbon. Forests help prevent or reduce flooding, such as what occurred during Hurricane Florence, because the soils beneath them tend to be relatively porous, according to “Forest and Floods,” published by the International Water Resources Association. Consequently, there is less runoff and erosion. All four Enviva plants are located in or near low-income neighborhoods or communities of color. The company often uses the lure of jobs to convince local governments to allow it to locate in their towns and cities. For example, Richmond County allowed Enviva to build a plant in Hamlet, just north of the largely Black town of Dobbins Heights. Earlier this year, representatives from the timber sector spoke at a meeting of the Joint Energy Policy Committee to rally legislative support for the industry. Chris Brown of the NC Forestry Association, which attended that meeting, did not return an email seeking comment on today’s press conference. Many universities, such as NC State, have forestry programs that encourage “management” of woodlands. Prescribed burns, for example, can help reduce the chance of wildfires. But depending on the program, the curriculum can encourage timbering as a management tool. Smith, a Democrat representing six counties in northeastern North Carolina, including Northampton and Hertford, where two Enviva wood pellet plants are located, said a bill could be introduced in the long legislative session to address the environmental and social justice issues presented by these industries. “It doesn’t have to be an either or,” Sen. Smith said of the balance between economic development and environmental protection. Thank you, Lisa Sorg, for all your excellent investigative reporting on environmental issues.